With the temperature finally rising here in the front range, the sunny weather is welcomed by graduation, Memorial day and, a 42 year tradition Territory Day's! Before we get in to the sheer fun that Territory Day's has to offer let me start by thanking our troops whom are currently serving and of course our retired veterans that we are so thankful for here at McCloskey Motors. Not only is a big part of our staff retired military but we also received the 2017 Best in The Springs For used cars and Military Discounts! So if you are a vet or current service member looking for a used car be sure to come see us so that we can roll out the red carpet for you and help you find the next car of your dreams! Now on to the fun Territory Day's is a Street fair located in the Old Colorado City between 23rd and 27th Street. Territory Day's offer's fun for all ages with three days of one of the largest craft vendor fairs in the state. The highlights for the kids would be the pony rides, petting Zoo, kids play area, toy train rides, wild west gun fight re-enactments, gold panning, live blacksmithing, period costumed characters, live birds of pray, my favorite the quick draw competition, and more. For the adults they have three beer gardens all three day's and a mechanical bull to test your rodeo skills. They will also have native american dancers, and live music all three days. 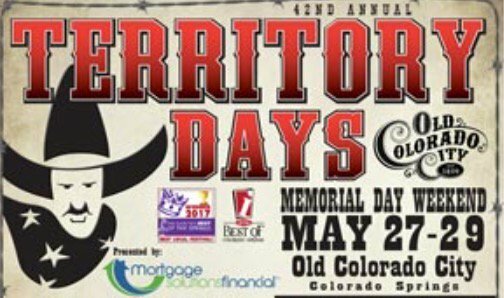 So be sure to come down to McCloskey Motors on Saturday pick up your beautiful next used car and head to Old Colorado City and see Territory Day's again located in Old Colorado City Between 23rd And 27th Street and to help you find Territory Day's here how to get there! Thanks For Reading and have a Happy And Safe Memorial Day weekend from all of us here at McCloskey Motors!